This was art done for Transformers Timelines Issue 1 "Dawn of Future's Past" featuring the Beast Wars cast of Maximals and Predacons right before they crashed on Earth. 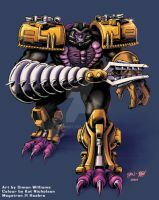 Shown is Megatron in his Pre-Beast Wars form, his alt mode (which was never seen on the show), and his exosuit (which was used in the Timelines Issue 1 story). The exosuit art has never actually been released as we did not have room for it in the issue so enjoy! Of COURSE it's based on CD Red Alert. So was the convention exclusive. Oh wow, so the Botcon '07 figure was him in an exo suit? That's a rather clever way of tying it in with his appearance in ep 1, I applaud you! I can't help but feel that Megatron's saying "GET OFF MY DAMN LAWN!!!!" do u have the rest? I hope one of these days someone somewhere (maybe IDW'll do a third BW series... well, we can hope.) will give us the exosuit. The destruction he'd wreak would be glorious. from Exo-suits, to rubber duckys. I love this artwork. So clean and tidy. will you be having one with him in the armor? Awesome! Would have loved to see it in the show. Gorgeous work. The exosuit looks neat, but what purpose does it has on the story? Aaah.. I remember this. Awesome stuff : D.
So him IN the exosuit is a revamp of Cybertron Defense Red Alert! VIVA NO MA'AM! JOIN THE National Organization of Men Against Amazonian Masterhood! I'm Darcia in the Wolfs Rain Crew! , SIT DOWN AND STUDY!!!!!! "Say goodbye to the universe, Maximals! The future has changed. Yessssss. The Autobots lose, evil triumphs, and you... YOU! NO LONGER EXIST!" I loved that design! I wish I had the toy.